Charles Roberts Upshaw, a MSE student from the University of Texas at Austin, dedicated his thesis to the topic, “Thermodynamic and Economic Feasibility Analysis of a 20 MW Ocean Thermal Energy Conversion (OTEC) Power Plant”. Upshaw’s purpose of the thesis was to investigate OTEC and assess its potential viability as an energy source from both engineering and economic perspectives. The results have been published in a paper that is linked below. The motivation behind Upshaw’s research comes from the public growing fears of climate change, declining fossil fuel resources, and increasing demand for electricity that has brought renewable energy technology into the global spotlight. OTEC was chosen by Upshaw partially because of its capacity to be a baseload power source that can utilize the vast amount of energy stored in the ocean’s natural thermal gradient. 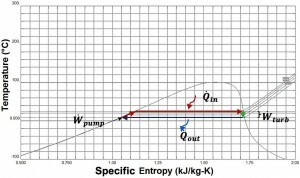 Upshaw’s research resulted in multiple findings about the feasibility and viability of OTEC power generation from a fundamental engineering and economic standpoint. For his particular model the minimum operational temperature at which the plant would not be able to produce enough power to run the water pump was approximately 15 C. More interesting nonlinear impacts were seen when analysing terminal temperature difference, water inlet/exit temperature change, and working fluid mass flow rate. The non-endpoint maxima suggests that these variables be carefully optimized to produce the optimal power output. The economic feasibility analysis showed that the estimated LCOE(Levelized Cost of Electricity) range shows the potential for OTEC, but also the uncertainty that has kept investors away from funding such large capital investments. The average LCOE is non-competitive compared to the United states, but when compared small islands that depend entirely on diesel generation, the economics suggest that OTEC could be viable. 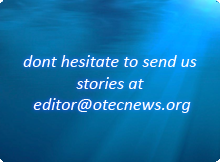 Larger OTEC plants (100MW) could potentially be more cost competitive, however, are unlikely to be pursued until the real-world operational lifetime and reliability of a OTEC plant is known, according to Upshaw.